It’s that time again. Time to start talking about the Class of 2020 majorSENIORS Crew! Can you believe that class of 2020 should be starting to think about their senior pictures? TIME FLIES, right? I feel like I just met with my 2019 girls! So what its the majorSENIORS Crew, you ask? Well, it’s all about YOU! 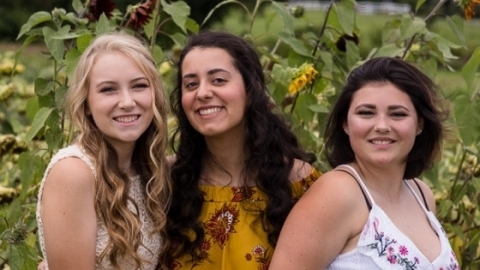 As a part of the Crew, you will have the opportunity to be a part of a group of young people representing schools throughout Central Pennsylvania and be a part of an exclusive community, fun photo shoots and more! Who am I looking for to be a 2020 Crew member? It can be girls who have overcome bullying. Girls who are at the top of their classes, cheerleaders, rugby players, singers, artists, book lovers, and fashionistas. There’s no pressure to fit in because everyone fits in. My majorSENIORS Crew represents all of us. My Class of 2019 Crew had the opportunity for Prom pictures with a bestie, a Spring Group shoot and modeling some outfits for Plato’s Closet. Check out these fun shots below! Oh, AND your senior portrait session is part of the deal! When you become a majorSENIORS Crew member, your senior portrait session is included! You also have opportunities to get together and have coffee with other crew members, giving back to the community, making new friends, classes just for you and SO MUCH MORE! Thanks to Highland Gardens for letting us capture some beauty there! And thanks to Plato’s Closet Mechanicsburg for letting us shop and model some of your amazing outfits! As you can see, we capture some awesome images and you have the opportunities to do things, meet people and have experiences that those not on the majorSENIORS Crew won’t. This year, I was challenged to create a manifesto for my business. I struggled with this for a while but now that I have it down, it’s really helped me to focus on what I want my majorSENIORS Crew to be about. So if my manifesto resonates with you at all, you NEED to complete an interest form. This will be the focus for the Class of 2020 and years to come. In fact, every majorSENIORS Crew member will get a copy of this to remind them to BE YOU!!!! So if you’re interested in all of the fun details about the Class of 2020 majorSENIORS Crew, complete an INTEREST FORM and let me know. You’ve gotta sign up for a parent meeting so make sure that you AND a parent are available to come to one of the dates listed. I know that schedules are busy so if you both can’t make it, I can email you a video of me sharing the details. Everything is more fun with a friend you already know, RIGHT!?! SO, I ask you to share this with someone that you think may be interested in this program. I have 2 NEW opportunities for the Class of 2020 mSC that I’ve never offered before and I can’t wait to share them with you. Well, actually I can! You’ll have to complete the interest form and sign up for a meeting to see what I’ve got up my sleeve for you Class of 2020 grads! If you want to see what we were up to with the 2019 mSC, here’s a couple of other blogs!